Powers/Abilities: Silent Fox was a minor magic user with some ability at creating bolts of mystic energy, force fields, and binding spells. 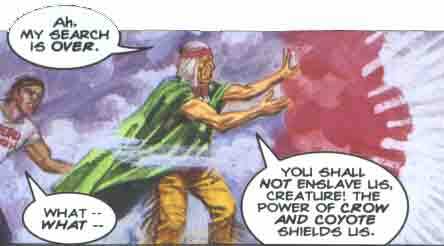 He required items such as the Hand of the Creator to perform his spells. History: (Strange Tales III#1 (fb)) - Just after his son Will had made the U.S. Olympic decathlon team he came back to the reservation to visit Silent Fox, and the two went for a drive in the desert to find some missing sheep. Silent Fox read a comic book about an alien named Orrgo (apparently so he could lure the enemy to him with "false shapes" and then trap it), and was suddenly assaulted by a creature matching the one in the comic. Recognizing him as the evil creature KhLΘg , having taken Orrgo's form, Silent Fox faced him with his magic, but found that he was outmatched. He had Will retrieve the Hand of the Creator from his hogen, and with it, Silent Fox was able to bind KhLΘg and temporarily banished him. (Strange Tales III#1 (fb) - BTS) <Possibly a few decades (see comments), ago> - A Keewazi delegation headed by Silent Fox was visiting New York City on tribal business at the same time Doctor Strange encountered with the "Szenics creature"/"figment" (a manifestation or some other association with KhLΘg) in the town of Mystic, Connecticut. The monster turned out to be the physical manifestation of a rumor started by Terry Szenics (to prove how gullible the working class was) which had been brought to life by the townspeople's imaginations. (Strange Tales III#1 (fb) - BTS) - Another Keewazi delegation headed by Silent Fox was visiting New York City on tribal business at the same time Human Torch and the Thing battled a group of alligators who had come up out of the sewers and later, down in the sewers, they fought the Golden Gator who led an army of gator men (a manifestation or some other association with KhLΘg). Strange Tales III#1 ((fb) - BTS) - At some point, someone, presumably Silent Fox, told Wyatt Wingfoot both stories of the Keewazi delegation being in New York City when Dr. Strange encountered manifestations of KhLΘg. 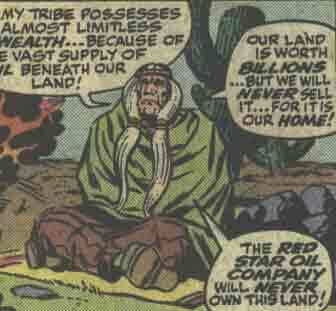 (Fantastic Four I#80) - Because the Keewazi Reservation sat upon a vast supply of oil, the Red Star Oil Company attempted to buy them out, but Silent Fox refused to allow this. The Red Star Oil Company plagued the reservation with a robot duplicate of Tomazooma, one of their gods, and had it begin destroying their oil fields. Wyatt's friends -- the Human Torch, the Thing and Mr. Fantastic -- from the Fantastic Four came to the reservation to help Wyatt, and Silent Fox at first mistook the Human Torch for a demon of flame, ordering his people to fire on him, but he did not fear the Torch's powers, and the Torch ended the fight when he realized who Silent Fox was. Wyatt came to Silent Fox to warn him of the danger posed by Tomazooma, but Silent Fox remained confident that it was a fake, and that the true Tomazooma would continue to protect them. He then radioed Washington D.C., informing them of the Red Star Oil Company's plans, and had the company driven out of America. Although the Pentagon offered to assist Silent Fox, he declined. Silent Fox led an army of Keewazi alongside the Fantastic Four to battle the Tomazooma robot, and it was finally destroyed by Wyatt and Mr. Fantastic. Although Mr. Fantastic feared that by destroying the robot they would demoralize the Keewazi, Silent Fox told them that Tomazooma had not failed them, and indicated what seemed to be a figure in the far-off mist-- the true Tomazooma. According to Silent Fox, he was ready to destroy the robot himself, but saw that he was not needed. (Fantastic Four I#138-139) - When Wyatt returned to the reservation after a lengthy absence, accompanied by the Fantastic Four, Silent Fox alerted him to the danger of a mystical "demon" lurking in the nearby Dark Hills, but the demon proved to be the Miracle Man, who had obtained magical powers from the Silent Ones, neighbors of the Keewazi. The Miracle Man unleashed his powers on the Fantastic Four, Silent Fox and the other Keewazi, causing the ground to split open, but the Fantastic Four saved Silent Fox and the others, and defeated the Miracle Man. (Marvel Team-Up I#32) - After Wyatt was possessed by the demon Dryminextes, Silent Fox alerted the Human Torch, and the Torch brought the parapsychologist Daimon Hellstrom, the Son of Satan, to the Keewazi Reservation, where Hellstrom was able to drive him out of Wyatt. (Fantastic Four I#269 - BTS) - Silent Fox passed away from unknown causes, and the mantle of chief fell to Wyatt. (Strange Tales III#1) - When KhLΘg returned to plague the Keewazi, Dr. Strange summoned up the spirit of Silent Fox to assist him, the Human Torch, the Thing and Wyatt, and Silent Fox told them the history of KhLΘg , but KhLΘg himself usurped Silent Fox's form to serve as his new anchor to the physical plane. The four heroes were finally able to vanquish KhLΘg by using the power of storytelling against him. Comments: Created by Stan Lee, Jack Kirby and Joe Sinnott. Strange Tales III#1 ((fb) - BTS) - On at least two occasions, Keewazi delegations headed by Silent Fox visited New York City on tribal business. During the first visit Doctor Strange had his encounter with the "Szenics creature" in the town of Mystic, Connecticut. The monster turned out to be the physical manifestation of a rumor started by Terry Szenics (to prove how gullible the working class was) which had been brought to life by the townspeople's imaginations. Later, during the second visit, the Human Torch and the Thing battled a group of alligators who had come up out of the sewers and later, down in the sewers, they fought the Golden Gator who led an army of gator men. At some point, Wyatt Wingfoot was told both of these stories, presumably by Silent Fox. KhLΘg was apparently responsible, somehow, for both the "figment monster" and the Golden Gator. It should be mentioned that the reason why Silent Fox read those monster magazines was so that he could lure the enemy to him with "false shapes" and then trap it.